Berlin is by far not the most bike friendly city, but it’s also not the worst city to cycle around. 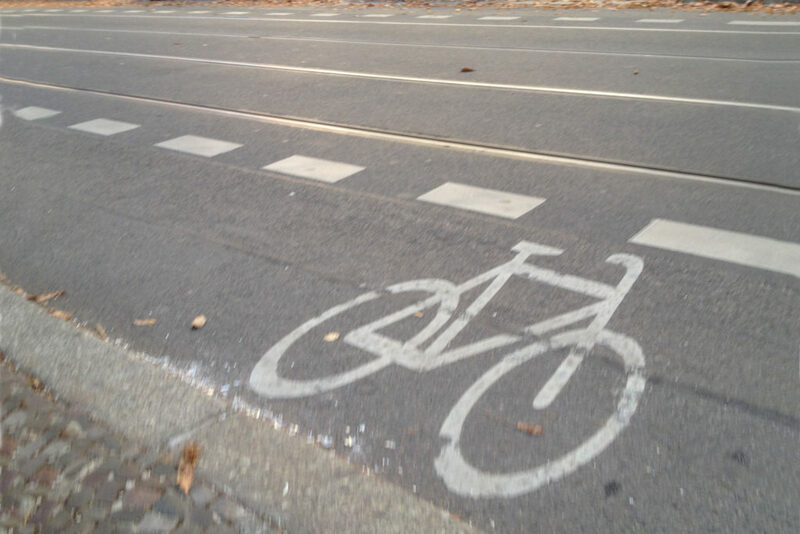 Many big streets have separate bike lanes – some streets like Choriner Strasse in Prenzlauer Berg and Linienstrasse in Mitte are even reserved for bicyclists. Only residents are allowed to drive through by car. Bike paths can be found on many of the larger streets across Berlin. The paths are usually marked with a white dashed line, with signs showing a bicycle and/or with large bicycle icons printed on the street, separating the car lane from the bicycle lane. Some bike paths can however also be found on sidewalks – and that can be a bit demanding for both pedestrians and cyclists. The marking on sidewalks usually is a bit more difficult to recognize since it’s often only marked by the color of the pavement. Then again the color / paint may be missing so there is no additional color to see – only a few white dashed lines would mark the bike lane. Additionally sidewalk bike lanes are crossed by pathways – and parked cars can block the view when approaching a street crossing. So if you’re traversing Berlin by bike, please be careful. Things might be a bit difficult and/or dangerous. Exploring Berlin by Bike can add a completely new and interesting perspective on how you see the city. On the one side the is a growing number of guided bike tours – but of course you can also explore Berlin on your own. You may want to check out the collection of over 20 recommended bike tours listed on the homepage of Berlin’s tourist office: Bicycle tours. You first choice may be to rent a bike for either a couple of hours or a few days. In the inner city districts rental bikes are available from many bike shops, but also hotels, hostels and even some regular shops are offering rental bikes for fees around 8 to 15 Euro per day. Another option would be to rent one of the rental bikes available at some bike pools. In the past most these bikes were operated / maintained by German rail operator Deutsche Bahn. 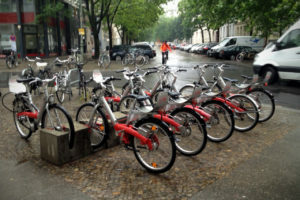 As of 2016 there will be another big player in the game of Berlin Rental Bikes: the Leipzig based company Nextbike is planing to increase the number of bikes available to around 5000. However, at the moment there seems to be only 300 bikes available in Berlin, according to the company’s website. Since this project is still in the making I don’t have many hard facts to offer concerning hourly fees and prices – and the actual renting procedure. So far I only know that most of the designated 700 bike pools will be located inside the S-Bahn ring – and prices will vary from 1 Euro per half hour to 9 Euro per day. Registration should be possible through the company’s website and at any on the bike rental locations . Bicycle theft is a serious problem in many European cities – and of course it is also a serious problem in Berlin. The situation is probably not as bad as in Amsterdam or Los Angeles, but you should be aware that a lot of bikes get stolen in Berlin. Almost everybody I know had at least one bike or at least some valuable bicycle parts stolen over the past couple of years. You can basically park your bike almost everywhere. As long as you’re not blocking a door or a driveway or a bicycle lane. Don’t forget to lock your bike – and when you lock your bike, be sure you lock it TO something. And let it be something stable. There are many professional bicycle shops all across the city – and there are flea markets. If you decide to buy your ‘new bike’ at a flea market, be aware, that the bike may not be in the best shape. Worst case: the bike is actually stolen. Do you have and thoughts, suggestions, additional recommendations or comments? Please feel free to leave your comment below. Thank you!